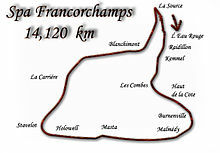 The 1960 Belgian Grand Prix was a Formula One motor race held at Spa-Francorchamps on 19 June 1960. It was race 5 of 10 in the 1960 World Championship of Drivers and race 4 of 9 in the 1960 International Cup for Formula One Manufacturers. Stirling Moss and Mike Taylor were seriously injured in crashes during practice, and Chris Bristow and Alan Stacey were killed in accidents during the race. With the 1994 San Marino Grand Prix, it is one of two occasions in which two driver fatalities have occurred at a Formula One race meeting. Practice for the event saw Stirling Moss and Mike Taylor injured in separate accidents, Taylor suffering injuries which would end his racing career, and Moss injured seriously enough to keep him out of racing for a number of months (he suffered breaking both his legs). In the race itself, the Lotus drivers Innes Ireland & Jim Clark got off to good starts before Ireland eventually spun out with clutch trouble by lap 14, Chris Bristow, driving a year-old Cooper for the British Racing Partnership, got off line and lost control at Malmedy, crashed into a four foot high embankment and was thrown from his car whilst battling for 6th with the Ferrari of Mairesse, and landed on some barbed wire which beheaded him, killing him instantly on lap 20. Five laps later, Alan Stacey was hit in the face by a bird at Masta as his car crashed then somersaulted off the track and landed in a field as it went up in flames and Stacey was burned to death whilst Stacey was still in the car on lap 25. It was the only Formula One race meeting in which two drivers were killed until the deaths of Roland Ratzenberger and Ayrton Senna at the 1994 San Marino Grand Prix. The race distance had been lengthened to 36 laps from 24 laps. The results highlight an unusual quirk in the rules regarding classification of non-finishers. Under modern rules, Graham Hill would have been classified third, since he completed lap 35 before the lapped Olivier Gendebien. Hill then retired, in the pits, but was not classified since he did not push his car over the line after the winner took the finish (as required by the rules of the time). In fact the rule about crossing the finishing line was inconsistently applied – at the 1959 German Grand Prix, Harry Schell was classified seventh despite only completing 49 of the race's 60 laps. ^ "1960 Belgian Grand Prix". formula1.com. Archived from the original on 22 December 2014. Retrieved 20 September 2015. ^ a b "Belgium 1960 - Championship • STATS F1". www.statsf1.com. Retrieved 12 March 2019.